The Box Hill Hawks are pleased to announce that promising Western Bulldogs rookie, Nathan Mullenger-McHugh, will be donning the brown and gold for the 2019 VFL season. The 21-year-old crosses to City Oval following two years in the VFL system at Footscray, taken with the Bulldogs’ first selection in the 2016 Rookie Draft, at number 18 overall. The selection was made after Mullenger-McHugh overcame a torn tendon in his ankle to return to the ranks of the Eastern Ranges, playing 15 games in the TAC Cup competition in 2016; averaging eight disposals, three marks and three tackles per game, as a key forward and pinch-hit ruckman. It was the elite speed, impressive vertical leap and raw competitiveness of the 196-centimetre Heathmont product which initially caught the eye of recruiters, as well as the potential to play key position roles at both ends of the ground. However, it was ultimately as a forward where Mullenger-McHugh found his feet at the Bulldogs, where coaches commended the youngster for his growth and development during his time at the kennel, and further praised his strong aerial game, sound hands and aggression for the contest. 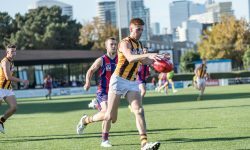 Mullenger-McHugh joins a growing list of exciting new recruits for the 2019 VFL season and only bolsters the Hawks impending premiership defence.